The tangled, thread-like filaments of NGC 4696 spiral inward toward the galaxy's bright core, where a supermassive black hole lies. A striking new image from the Hubble Space Telescope captures an extremely detailed view of the galaxy NGC 4696 and the tangled, thread-like filaments stretching from its bright galactic core. Located roughly 150 million light-years from Earth, NGC 4696 is a member of the Centaurus galaxy cluster — a group of hundreds of galaxies bound together by gravity in the constellation of Centaurus. NGC 4696 is an elliptical galaxy, which means it boasts a round, elongated shape and lacks the distinctive swirling arms of spiral galaxies. The recent Hubble telescope observations provided the most detailed view of the galaxy's intricate structure captured to date. Using these observations, an international team of scientists led by astronomers from the University of Cambridge took a closer look at the swirling filament structures. "They found that each of the dusty filaments has a width of about 200 light-years and a density some 10 times greater than the surrounding gas," ESA officials said in the statement. "These filaments knit together and spiral inwards towards the center of NGC 4696, connecting the galaxy's constituent gas to its core." 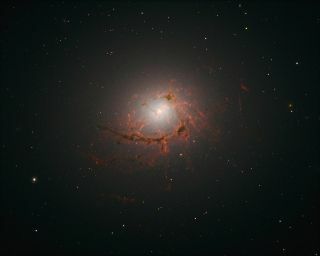 The unique structure of NGC 4696 likely resulted from an active supermassive black hole that lies at the galaxy's core. Energy generated by the black hole heats gas within the galaxy's inner regions and propels that material outward, creating the marbling effect seen in the Hubble telescope photo. "It appears that these hot streams of gas bubble outwards, dragging the filamentary material with them as they go. The galaxy's magnetic field is also swept out with this bubbling motion, constraining and sculpting the material within the filaments," ESA officials said in the statement. "At the very center of the galaxy, the filaments loop and curl inwards in an intriguing spiral shape, swirling around the supermassive black hole at such a distance that they are dragged into and eventually consumed by the black hole itself." Surprisingly, NGC 4696 consists of mostly old or aging stars, even though it has a large reservoir of gas and dust that would otherwise give birth to new stars, ESA officials said. Learning more about the complex structure of NGC 4696 may help scientists better understand why so many other nearby galaxies in the universe appear to be in a similar dormant state.